Italian architect Stefano Boeri is not afraid to talk about his massively failed, 42 million euro redevelopment project. The mostly mediocre Monditalia show at the Architecture Biennale in Venice featured a real diamond in the rough in the video installation ‘La Maddalena’ by Ila Beka and Louise Lemoine. The partners of the Living Architectures collective are well-known for their Koolhaas Houselife movie. 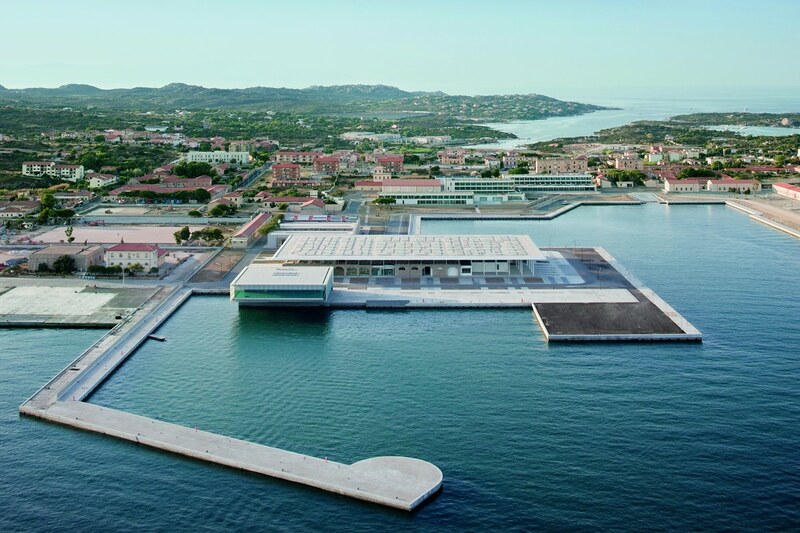 They were commissioned by Rem Koolhaas to visit Stefano Boeri’s massively failed redevelopment project on the Italian island of La Maddelena – a redevelopment which ended in monumental failure. In 2008 the Italian architect was asked to make a design for the venue for the following year’s G8 summit. But months before the actual summit former Italian prime minister Silvio Berlusconi decided to move the congregation of world leaders to the mountain town of l’Aquila. The venue at La Maddalena, nearing completion, was subsequently abandoned. According to the filmmakers the story represents ‘one of the darkest moments of Italian politics’ and ‘one of the greatest examples of financial and environmental waste in recent years’. And while most architects normally choose not to confront their failures, Boeri was willing to collaborate with the filmmakers, visiting the site with them and giving his perspective on the whole unfortunate episode. The film is currently exclusively on show in Venice (watch the trailer below), but Stefano Boeri kindly allowed us to republish an article he wrote for Abitare magazine in 2010. It is a much more detailed description of his view on the process resulting in the failure of la Maddalena. Although it is certainly applaudable that an architect openly reflects on what went wrong, this is by no means the entire story. Boeri’s version remains contested. Namely, it has been argued that collaborating on a venue for a summit where the eight most powerful leaders in the world decide on the future of the rest of the world population is a mistake in itself. The previous edition of the G8 in Italy, in 2001, was met by massive protests of the alterglobalisation movement. This resulted in one of the largest urban insurgencies in Europesince World War II. Boeri, however, saw no harm in constructing a safe haven for the world leaders on a remote island, far away from a possible confrontation with the public. The buildings materialised, but the summit and the crowds never came. Watch the trailer and read the article below. Over the last few weeks the whole of the last twenty months has constantly been present in my mind. I have ordered and re-ordered memories, places, facts and the way that relationships and alliances developed over time. This obsessive ‘looking-back’ has helped me with more clarity what happened around me, and around us, and to our La Maddalena project. It is not always easy to develop general arguments through the use of introspection. This time, however, perhaps more than on other occasions – it is important that an effort is made to externalise these issues. And this process might also be of some use for others. Here, then, are some reflections that range from details to ideas about news, through memories and general considerations about the profession of the architect. I think that I was, along with Guido Bertolaso (the Italian Civil Protection Director), the only person to follow the La Maddalena story from the beginning to the end. We were there during the entire course of events, from my studio in the beginning right up to the time of the building itself, including the period when various political and juridical events altered the whole structure of events. I was at the first meetings with Renato Soru (the Governor of the Sardinia Region) and Guido Bertolaso in January 2008; those in Rome and in La Maddalena with its citizens and its Mayor. I was there when Angelo Balducci’s Mission Unit arrived, when Romano Prodi’s government fell, when Silvio Berlusconi and President Napolitano came to visit the site. And then there was the moment when Berlusconi started to suggest other possible sites for the summit, after work had already begun in La Maddalena, and when Soru resigned as President of the Sardinian Regional Assembly, something which worried us greatly. And again when Gianni Letta, Bertolaso and Berlusconi, a few days before the G8 summit was moved to Aquila on the 21 April 2009, came to look at the building site as work was coming to an end. They were all smiles. It was reassuring. And I was there just after that, when we were most worried, and a sense of panic had taken over, when we thought we wouldn’t even get paid and we were scared that the businesses involved would leave the project, and the building-sites would become a huge ecological disaster-area. And I remember the anger and shame of those La Maddalena residents who had not been supporters of Soru. And I was also there during the final months of the project, with Bertolaso on his return to the Island, after his successful effort to bring the Louis Vuitton Sailing Cup tournament to the site. And, finally, I was around when a series of articles in La Repubblica newspaper criticised the poor state of the building sites (articles which were not a reflection of reality) and when the judicial enquiries began and our clients were arrested. In the days which followed the decision to move the G8 to Aquila, as I was visiting the ex-Arsenale in La Maddalena, a site which had been completed in double-quick time, I reflected about the public money which had been spent here and I wondered about the real reasons behind such an absurd decision (to move the G8 at the last minute to Aquila). An enormous sum was being wasted. There was no justification for this choice. In La Maddalena there had been no sense of lavishness which might have caused offense in a country which had been affected by the disaster of the earthquake. And in Aquila there was no need for a global platform to distract people from the ongoing tragedy in their daily lives. I began to wonder at that time what was behind this decision, whether the reasons were good or bad ones and if these reasons had been complicit in a decision which everyone went along with, far too easily. If I think about the way in which I worked from December 2007 up to today two moments come to mind. In the first period I was a consultant to Renato Soru and Guido Bertolaso in terms of the decisions needed to host the G8 at La Maddalena. The idea was to transform a brief, powerful and essentially useless event into something permanent and useful in the future for Sardinia and the archipelago. 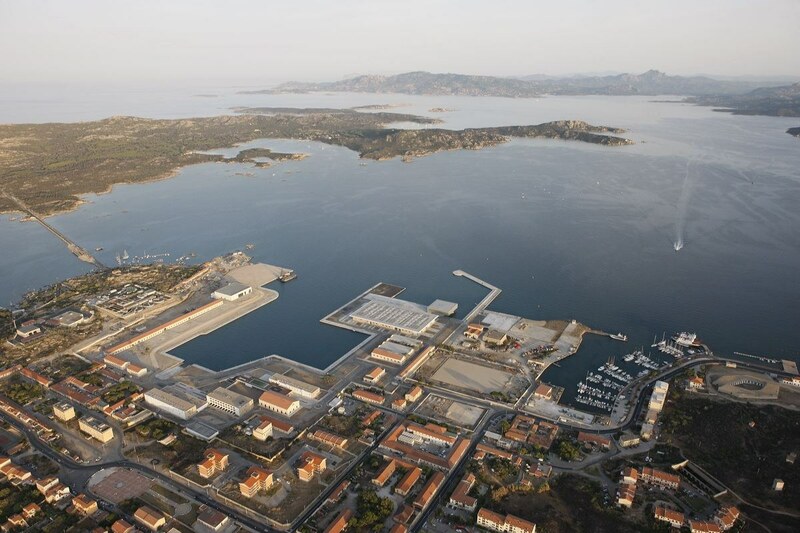 We wanted to develop the abandoned and polluted ex-military Arsenale site into a big multi-functional nautical centre, which would be able to host building sites, a convention centre, sailing schools and a hotel as well as shopping and exhibition areas. All this in an area with extraordinary seabeds that is also one of the most beautiful settings in the world. But first we needed to build, in a few short months, the area for the G8 itself, with all its tight and complicated security requirements and diplomatic protocols. So we decided to imagine every building as if it had a double life: first they would function during the three crazy days of the G8 event itself. They would be prepared for a large-scale geo-political event as if they were dressed for a party, and then, with the cameras gone, with these clothes removed, a solid architectural structure would remain, which would last over time and have a precise set of activities and uses. The buildings in La Maddalena, as with all architectural constructions, are also the product of the contradictions and the idiosyncratic choices which accompanied their creation. 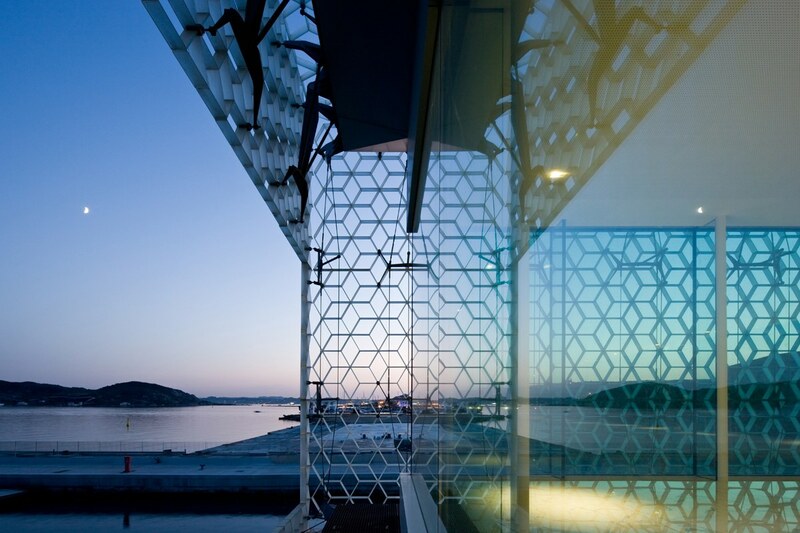 There is no doubt that the buildings we constructed reflected a kind of ‘extra’ effort, which was also an attempt to avoid the usual clichés linked to geopolitical and global events. 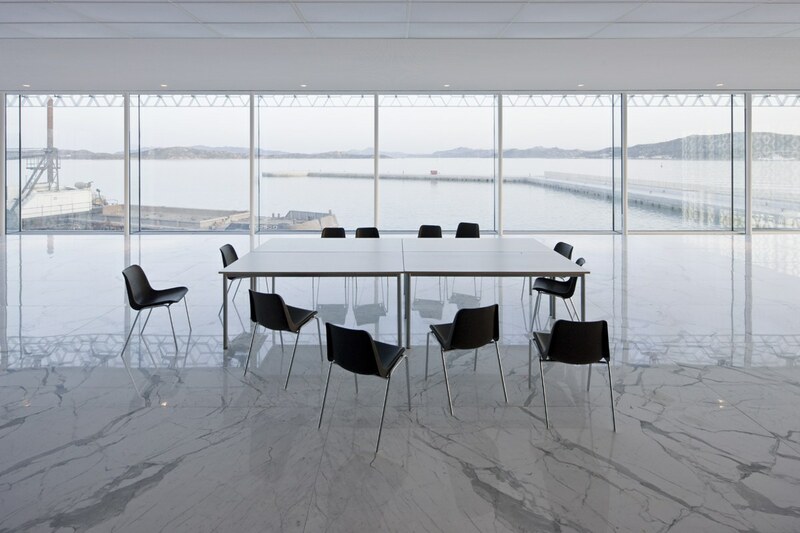 We were trying to be anti-celebratory, we were looking to create minimalist spaces, with forms of non-muscular monumentality, and our work was inspired more by the context of the archipelago’s landscape than by the ceremonial aspects of the G8. In a way, we wanted to do something so extreme that our work also highlighted what we were trying not to do. Architecture is also made up of that which you want to avoid. You can not run from the enemy. In the second phase, which started in July 2008, the work changed, as did the conditions under which it was carried out. We worked with the company who won the competition for the project (whose owner, Diego Anemone, was later arrested) but we lost control over the project, which entered its dizzy final building stage (with just ten months in which to clean up an area of 150,000 square metres, construct eight buildings and 2 kilometres of seafront). We were working on the buildings in the central part of the ex-military Arsenale (and it is worth stressing one thing at this point: we never had anything to do with the project for the ex-military hospital). There were more than thirty of us in La Maddalena alone, putting together the details of the project and trying to check on building site decisions that, in many cases, we simply recorded on the cad. There was no central direction of the work or central coordination of the planning side, and we were also excluded from the metric calculations (we were only allowed to use this as a backup for the architectural side of things). Whenever the clients came to visit we would make an attempt to impose our presence and our ideas. But beyond the desire to see our work built in real time, we also had other reasons for being there: for ten months we formed a kind of technical support team for the La Maddalena council and the Civil Protection agency, and we were always willing to reply to questions linked to designs, technical data or planning ideas. But this role was in the end just a kind of dignified consolation prize. In recent years, in terms of public works in Italy perverse forms of exchange mechanisms between politics and architecture have become the norm, in part thanks to protocols and rules such as those known as the ‘appalto integrato’ (integrated contract). On the one hand architecture has been called upon to carry out activities of a political nature, such as the inclusion of stakeholders in planning decisions and outcomes: that is to see electoral consensus as part of the planning process. On the other hand the political system has taken over some crucial aspects of architectural work, such as the choice of technical consultants, the selection of businesses and above all (for public works) the selection of those who coordinate and organise projects and construction. From people whose job it was to check carefully on the final outcomes of projects, we have now become seen as inspirational creators of public politics. Our competence seems to have shifted from the mineral to the immaterial sphere. The psychology of the client (in terms of an attentive study of the idiosyncrasies and secret desires of those who commission projects) seems to have taken over from the psychology of the user, that is the capacity to understand the emotions, reactions and needs of those who will inhabit the spaces that we have visualized. It is accounting that distinguishes architecture on paper from built architecture. At a certain point ideas are no longer paid in theory and they start to cost real money, a sum multiplied by another sum. For me personally, the accounts linked to the G8 and La Maddalena – for the projects that we carried out (lots 4 and 5) had two phases linked to payments. In the first phase, after our preliminary role as consultants had passed, we laid out the costs which were required for the businesses in the list provided by the Civil Protection agency and for the integrated contract. In the second phase, for the architectural metric estimates (which we had to back up with designs and data) we recorded a much higher figure. But if we take into consideration the high levels of risk involved in the building process and the inevitable inaccuracies in an estimate based on preliminary consultation, these figures were reasonable. The costs had already risen considerably thanks to ‘extra costs’ which had been already provided for the competition for the building works, with 57% extra added thanks to the problems of working in three shifts, on ‘an Island within an island’ and that of the necessity to ‘respect the timetable’. Pre-decided extra costs are the opposite of voluntary decreases. If decreases have a competitive potential for those taking part in competitions, ‘extra costs’ are structural and become a precondition that cannot be changed. They guarantee compensation in advance for businesses that find themselves in trouble, or are working in emergency conditions. But the idea of an emergency in this case was questionable, if not absolutely ridiculous. The ‘extra costs’ were in reality a prize in advance for the willingness to work quickly. But the speed of work was seen selectively. At La Maddalena there were extra payments for businesses, but not for the architects, and there were huge wages for the technicians on the Mission Unit and the directors, but not for the building workers. The ‘extra costs’ due to the speed and urgency involved in the work… well, they weren’t for everyone. I like working in a group, as a kind of director. I think I have the capacity to choose who will work with me and to understand their talents. I also think that I am often disorganized, I occasionally work irrationally and sometimes in a rough and ready way. And these clear weaknesses probably allow those who work with me to bear a presence that could otherwise be overbearing. I have no doubt that the group of architects who worked with me on the G8 project will make an important contribution to the future of Italian architecture. They are young (about 30, on average), of high quality, cultured, hard working, energetic and also thoughtful when they need to be (that is, when they are at their most energetic). They are just as interested in politics as they are in architecture (as am I) and like me they think that they can influence politics through architecture. We worked in extraordinary weather conditions, on an ‘Island within an Island’, with winds which led to grey and stormy days, and then days with bright sun and light, and we were always close to gusts of wind, thunderstorms, brief respites and flashes of sun. As with the weather, we were also exposed to unpredictable and often absurd changes brought about by the shifting nature of Italian politics. And then there were the aspirations and worries of the people of La Maddalena. And we became almost addicted to the dizzying sequence of events that carried us along and left us breathless and exhausted, anxious, surprised and always with impossible deadlines to meet and with surprises to deal with. We have still not recovered from that time. We know. We should have known, that the life of architecture begins well before architects become involved, and well before the planning process begins. It starts when architecture is decided, financed and chosen by those who wanted and asked for it. But not even this knowledge helped us to accept the fact that – once that intense but limited period linked to the design itself was over – we had to detach ourselves from the after life of our architectural creations, leave them behind, accept that they carry on existing without any further link to us. The truth is that, when people work with passion on something which is then built, this structure made up of glass, metal and cement becomes part of our emotional existence in ways which are difficult to control, and which makes it hard to accept even the idea that that thing will have to be abandoned by you and left to its own devices. I was a victim of myself, of my ambitions, of my decision to involve 53 architects on this project (nearly all of whom were working with me for the first time) in order to complete work that I could probably have done (not necessarily in a better way, but well enough) in my Milan studio with my 15 faithful collaborators. That which I gained in curiosity, relationships and enthusiasm I lost in terms of organisation and above all economically. This work has been a financial disaster. I have already spent everything I earned on it and I am now terrified by the thought that the businesses will not finish paying me. After having built in ten months that which an architect usually completes in 15 years, there is a risk that in a few months I will have to close my studio which has been open for 25 years. Not bad, is it, as a form of dual acceleration…. But I was also the victim, for a few days, of attacks from colleagues (some of whom remained anonymous). People were caught up in the media frenzy and were unwilling to make the necessary distinctions, or to discuss the actual facts linked to what had taken place. These same people cannot accept the possibility that you might be able to create good architecture without giving up on your political and civic passions. These people are jealous of the success of others, and have failed to use this jealousy to create a sense of healthy competition. They even wrote lies, on-line, in order to take the moral high ground. When jealousy does not become a way of stimulating healthy competition it becomes a self-defeating syndrome, something that is at its most powerful in the world of Italian architecture. Recently I have asked myself time and again if I was in some way responsible for what happened. I think I was, involuntarily. Obviously I neither saw nor understood anything which made me suspect that there were illegal of secret agreements in place (those identified, it seems, by the ongoing judicial inquiries) – between clients and businesses, state representatives and private suppliers. If I had had any inkling of these forms of contact, I would have immediately abandoned the whole development. But my decision-making role was a marginal one and even at the most important point of the project, when the work was being constructed, my duties effectively prevented me from understanding what was happening, even when I was constantly close to or inside the building sites themselves (where it was often clear that I wasn’t welcome). I have two explanations for this. First, we became obsessed with the question of deadlines (which for months was a daily fixation), and then there was the participation in the project, as a kind of guarantee, of representatives from the highest levels of the State. But I was also complicit in the situation of ‘reduced control’ we found ourselves in, in the sense that I was presumptuous in my belief that I would be able to prevail over those who were checking on us and keeping us distant from the decision-making processes. The Civil Protection agency is a ‘good army’ made up of young men and women – thousands of passionate and willing volunteers, who work in a disciplined, austere and friendly fashion. But at La Maddalena, after a few weeks, the Civil Protection agency stopped performing its duties (and perhaps it could never have performed them). In place of the women and men in blue tops, a series of technicians from the ‘Mission to celebrate the 150 years of the Italian Republic’ turned up. Nobody has commented on or discussed this shift in personnel, before now. In La Maddalena the architects who worked with me drove around in old and rusty cars, and roomed together in flats in the city. Meanwhile the technicians from the Mission Unit – complete with their Raybans – drove Audis and BMWs and rented villas on the island’s coast. Outside of their offices these two groups rarely came into contact. Their locations and their relationship with each other, and with the island, were different. Sometimes, differences in behaviour is a limit to communication, sometimes they defend us from dangerous relationships. The details, in a complex story like this, are always crucial. Over a period of just a few months, as the editor of a specialist architectural periodical, I have experienced three types of conflict between news and architecture. At first, investigative journalism was the clear winner of this conflict. Before and during the building site phase, we were sworn to secrecy: we were obliged not to reveal anything about our work by an ordinance issued by the Prodi government. However, despite the fact that we could not write about that which we were doing and what we saw, we witnessed a form of investigative journalism that easily penetrated the boundaries of the G8 building site. These journalists were quicker and more alert than us, they discovered things that we did not know about and then they divulged and analysed this information – in political and news magazines. This was a time when nobody (in theory) knew what we were doing (to cite just one example, we could not have announced that the work for the G8 at La Maddalena had already almost reached completion in April, and were ready to be used) and it was only thanks to these forms of investigative journalism that we began to understand that something was going wrong very close to us, in the coordination of the work. In May, when the building itself was finished, a second phase began. Finally, the question of the architecture itself began to take centre stage. Italian and international newspapers (from the Corriere della Sera to the Frankfurter Allemeine) ‘discovered’ (at quite a late stage) the results of a G8 which had not taken place but which seemed worth their attention. And then the specialised periodicals also made a contribution (A+U, Icon, Mark, Lotus International..), as if to underline the end of the ‘news’ phase. The news-related aspects were over, and so it was time to move onto the architecture. But this second phase was very brief. In recent weeks the news-related aspects have come back, in a violent and in some ways liberating way – under the guise of political and judicial journalism. Here the phone tap transcripts have set the agenda – transcriptions and overheard conversations projected like subtitles under our architecture. Our buildings were forced into new and involuntary forms of ownership and authorship. Poor buildings. 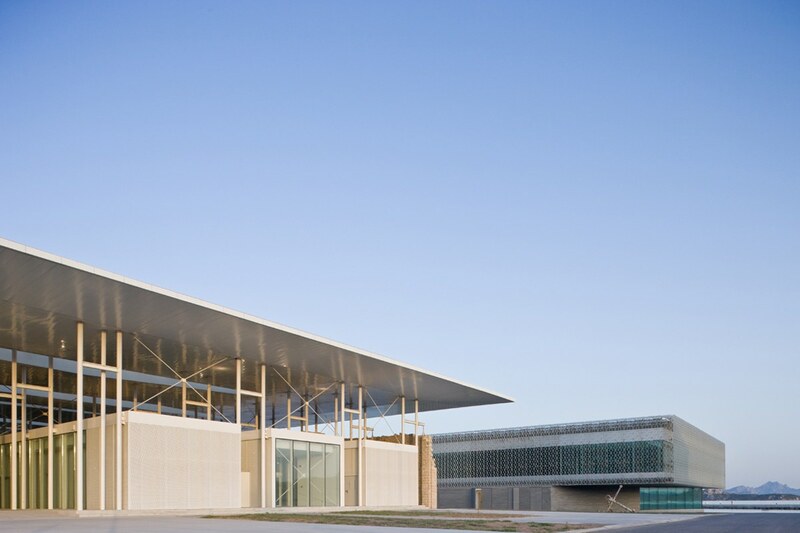 I have always been fascinated by the relationship between news and architecture. For four years, every month, in the pages of Domus I published images from architecture that had been affected, often unknowingly, by news and events. And I have always asked myself why these two spheres come into contact so often and why news events are so common around spaces and buildings which cultural codes view as ‘architecture’. Is it the symbolism linked to architecture that attracts news events, who see them as a kind of counterpoint or a platform? Or do journalists choose them in order to tell stories and thus they include – as a way of adding something to the picture, some flavour, or some bizarre quirk – the accidental presence of architectural works? Whatever the answer, it turned out that our architectural creations became a symbol (in newspapers and on the global media) of a negative instance of Italian corruption. I can find consolation in the fact that all this has a meaning. A few months ago (well before the recent judicial inquiries shed light on this whole affair) when I chose for the cover of the book “Effetto Maddalena” the image of a police helicopter flying over the House on the Sea, I had understood, even then, that our architecture was destined to have news coverage in its very soul. The works which we imagined have been built. And because we were stubborn, they are exactly how and where we wanted them to be. There they are, in place of an ex military armoury which until a few months ago was abandoned and a potential ecological disaster waiting to happen which has been cleaned up both along the shore and in the water itself. They are now a formidable resource for an archipelago which every day, from May to September, is used as a kind of swimming pool for thousands of boats which currently spend their money and sign their rent contracts in the small port (which has no city linked to it) on the Emerald Coast or in the boat yards of Olbia. 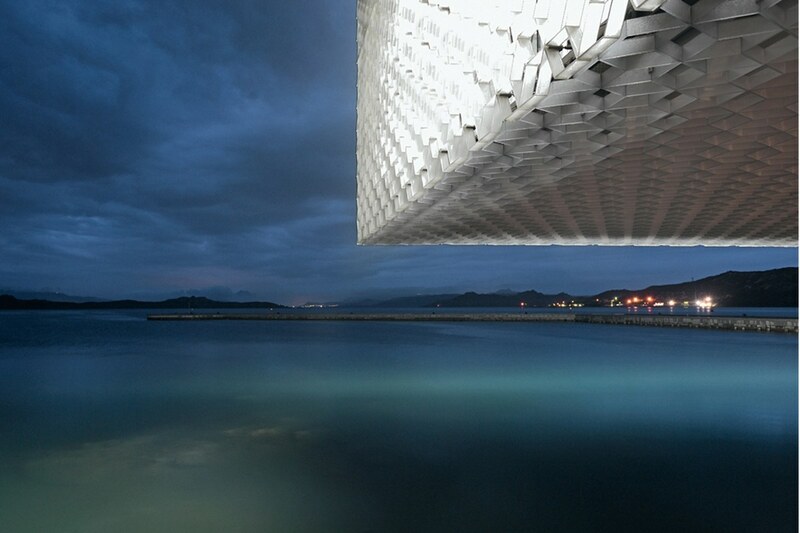 The nautical centre which Renato Soru had envisaged is now a reality, even if it is still an empty shell. 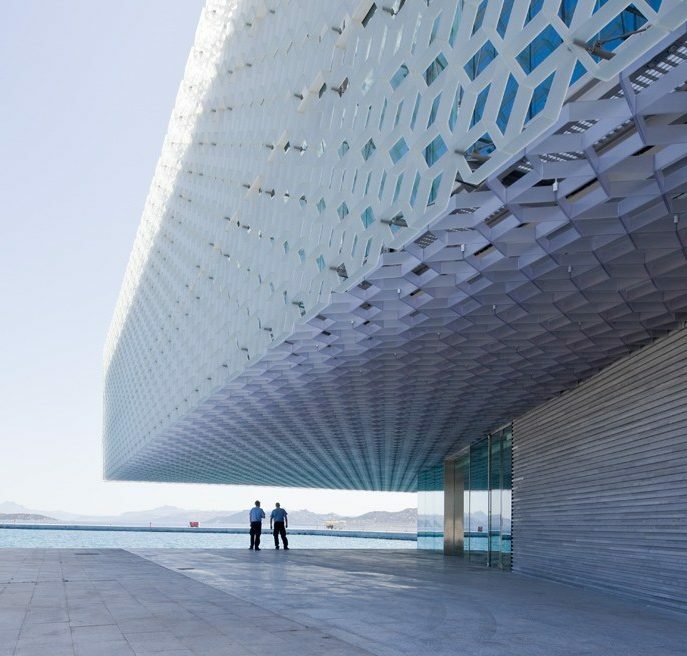 The Vuitton Cup with its sailing sports competition, which symbolised a form of environmentally sustainable tourism, will be the best inauguration we could have hoped for, but the destiny of these buildings is still uncertain. 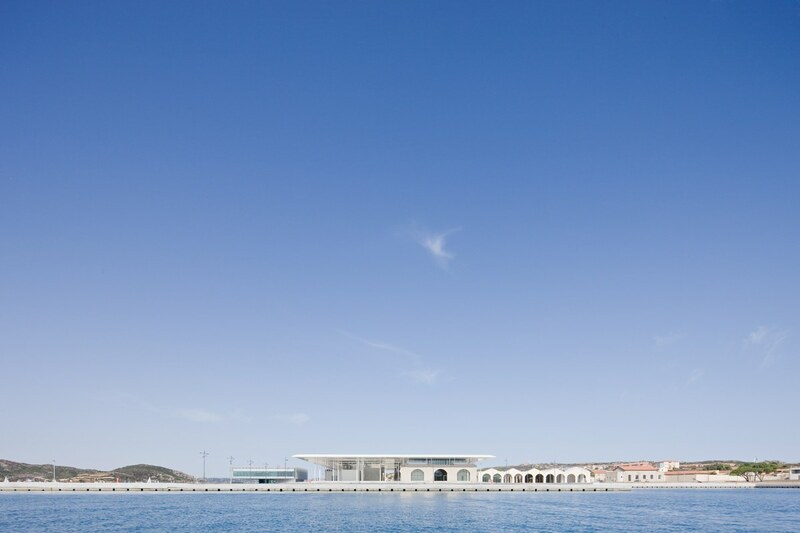 We have built a Mediterranean port, which is close to a real city (even if that place itself is undergoing something of a crisis), a public port, largely open to citizens and visitors, which can also host private events with more controlled access. It is a multi-functional port, which could provide work for hundreds of young island-residents. It would be easy to ruin what we built. But we have built it.Our profession is a strange one. We intervene in the real world, we control things in the real world, buildings, changes to them, and sometimes even their usury. And we often convince ourselves that the spaces we plan and see built are crucial in terms of politics, culture and economic decision-making. But nothing – no sense of beauty or efficiency, not even in hindsight – can justify the behaviour and the shameful choices that have dominated the news in recent weeks. The relentless, powerful arrogance of built architecture, which concentrates on the long-term influence of its success – is nothing compared to the anger of an entire country. But it is all that we are left with and, with a mixture of dignity and irony, we are forced to hold onto this hope. Stefano Boeri (1956) is a Milan-based architect. He was editor in chief of the international magazines “Abitare” and “Domus”. Currently Professor of Urban Design at the Politecnico di Milano, he has taught as visiting professor at Strelka Institute, Harvard GSD, Berlage Institute and the Architectural Association among others.